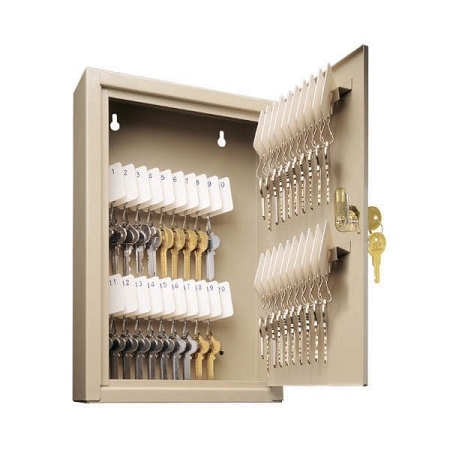 The STEELMASTER UniTag Key Cabinet, from MMF Industries, is perfect for offices, rental property management companies, and any other organization that needs to storage and manage their keys. This versatile key storage system will keep track of the keys you loan out. Attach each key to one of the included, numbered key tags. Then place the tag on the one of the key slots in the cabinet. When a key is loaned out, fill out one of the “Out Key” control tags recording the key number, who received the key and the date it was loaned out. Place the "Out Tag" in the same slot that the key occupied. For additional control, fill out a record chart to further document the key activity. This key cabinet is made of durable, heavy-gauge steel (20% Recycled Content), and is painted with a chip and scratch resistant finish. The key cabinet also features a full, piano-style hinge that allows users to open the cabinet door completely and easily access all the keys stored inside. The single key lock with two keys is mounted on the door. The key cabinet has 4 pre-drilled mounting holes and mounting hardware is included to make for installation easy. Available colors are sand and black.